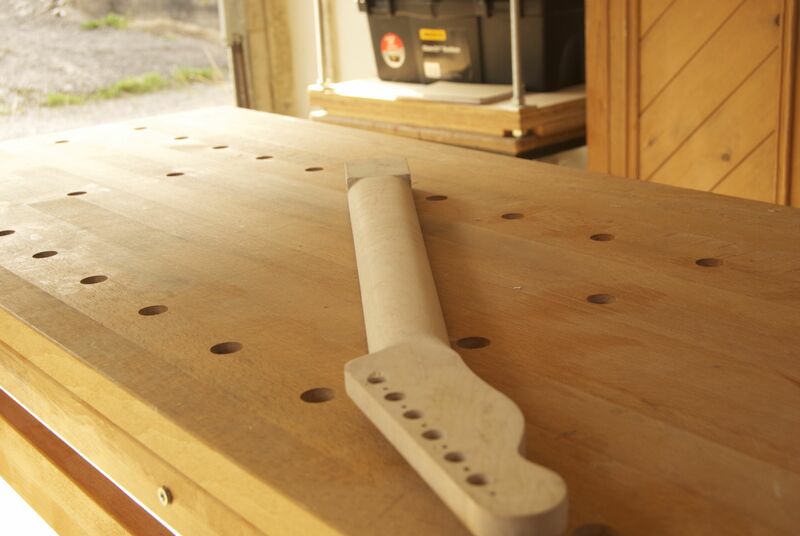 Today I’ve been sequestered in the workshop carving the neck for the Telecaster build. The neck is a nice piece of birdseye maple, with some unexpected subtle flame across the back, and a birdseye maple fretboard. To add some visual interest, but stiill stay true to the simple workhorse appeal of Tele type guitars, the fretboard and neck are separated by an accent line of black dyed sycamore veneer. The scratch plate is black/white/black laminate, and along with the black tahiti pearl fretboard inlay and side position dots, creates a consistent theme with the lack veneer. Earlier this summer I had inlayed the black pearl dots, and shaped the fretboard to a vintage correct 7.25″ radius, and the next task was to carve the neck. This guitar is largely based on 1950’s Telecaster’s, and so for neck profile I was aiming for something quite chunky with a “boat” shape rather than the modern “C” profile – I never get on particularly well with super skinny necks. One of the real advantages of having an instrument custom built is the opportunity to have a neck profile carved specifically for your hand size, and playing style – no matter how good an off the shelf guitar is, the neck profile will always be something of a compromise. Unlike modern Fender guitars, the neck on this guitar is a constant 1″ thick across the full length of the neck. As with the neck on Esmerelda, I decided to leave a little more material on the bass side of the neck to create a slightly asymmetric profile which supports the thumb. I first read about Brook Guitars using this on their instruments, although I think that the Fender SRV signature models may also have an asymmetric neck profile. 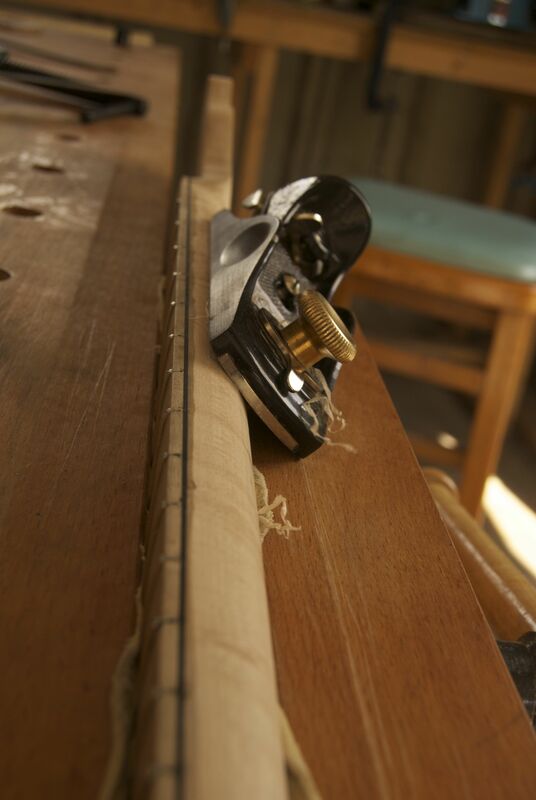 The following is an old picture which shows roughly what the neck was like before the carve, although as I mentioned earlier, the fretboard had been radiused and the inlay fitted between taking the photo and carving the neck profile. 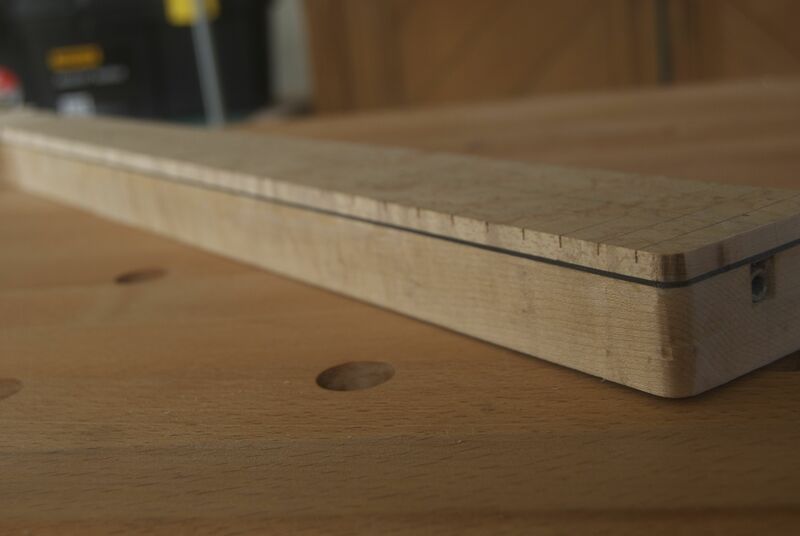 I start by establishing the profile I want at the first fret, and immediately before the body join, by rasping in a rough profile. I use Auriou rasps exclusively; a 9 grain cabinet rasp, and a 13 grain modellers rasp for fine work. The 9 grain is aggressive, but leaves a good finish and is still precise enough to allow you to work up to the line. I then join the two roughed out profiles using a spokeshave – this particular spokeshave is an old Record No.51 of my grandfather’s which I have recently restored. The profile is then fine tuned with a block plane (pictured is my Ray Isles tuned Stanley block plane) tracing the 6 string lines, and staying clear of the centre line of the neck. 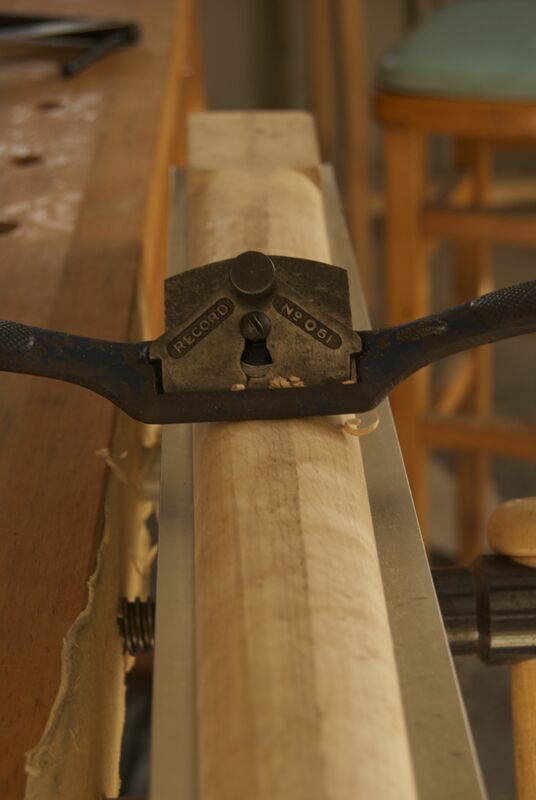 The rasps are also used to tweak the profile along the length of the neck, until I am happy that the neck is the right shape and that there are no flats, humps or hollows. The final stage is removing previous tool marks and smoothing out the profile using sheets of 150 and then 180 grit paper in what I’ve heard referred to as the “shoe shine” method. Occasionally, there is still a corner or ridge just below the edge of the fretboard, and this is gently eased out with some 80 grit paper and light finger pressure, followed by the 150 and 180 grit papers again. 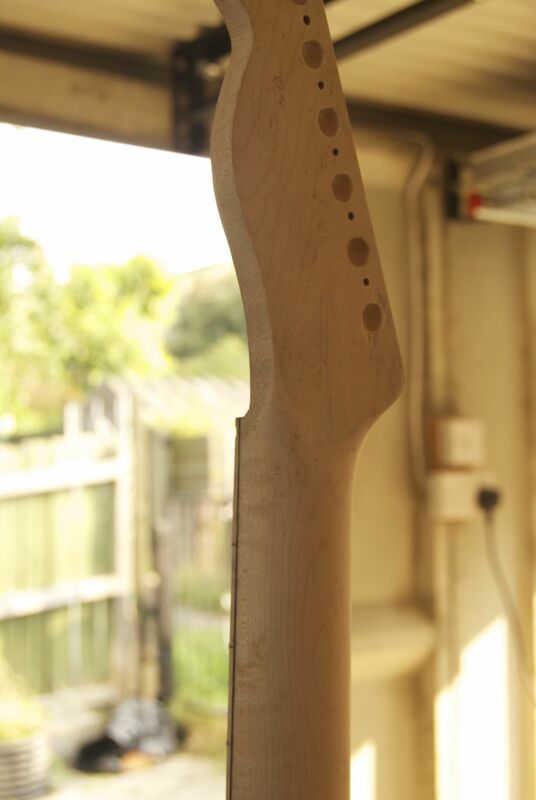 Here you can see the final profile and the transition from the headstock to the neck profile, which was carved using the small modellers rasp and some tightly rolled 150 grit paper. Also visible is the black veneer sandwiched between the neck and fretboard. This entry was posted in Lutherie, Telecaster by overthewireless. Bookmark the permalink.